Topical Press Agency/Getty ImagesCirca 1912: The luxury White Star liner ‘Titanic’, which sank on its maiden voyage to America in 1912, seen here on trials in Belfast Lough. USA Today reports Blue Star Line Chairman Clive Palmer has finalised the $700 million dollar project and Titanic II is set to make its two-week maiden voyage in 2022. Blue Star Line Chairman Clive Palmer first announced his intention to build a replica of the famed ship in 2013 during a black-tie gala, but the project was suspended due to financial constraints. But USA Today reports Palmer has finalised the $700 million dollar project and Titantic II is set to make its two-week maiden voyage in 2022. “The ship will follow the original journey, carrying passengers from Southampton to New York, but she will also circumnavigate the globe, inspiring and enchanting people while attracting unrivalled attention, intrigue and mystery in every port she visits,” Palmer said, according to Time Magazine. According to Blue Star Line’s official website, Titantic II will also have the same class categories as the original Titanic-First, Second, and Third Class-will replicate the Titanic in length, and will represent original dining rooms and restaurants. 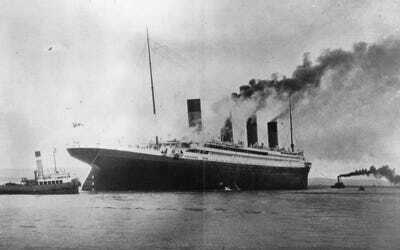 Deemed “practically unsinkable,” when it debuted as the world’s largest passenger ship at the time, the original Titanic sank in the morning hours of April 15, 1912 after striking an iceberg in the middle of the Atlantic Ocean. Of the 2,240 passengers onboard, over 1,500 lost their lives. MSN reports Titanic II will accommodate 2,400 passengers and 900 crew members. There is no word yet whether a “Jack Dawson” or a “Rose DeWitt Bukater” will be among the upcoming ship’s initial guests.